MOSCOW – Three activists were arrested Tuesday during a demonstration outside the offices of RosTekhNadznator – the government body that oversees the nuclear industry – while they protested Russia’s policy of extending the engineered life span of the country’s aged nuclear reactors. The detentions are part of a growing trend in which nearly every environmental protest for the past seven months has been dispersed by police and resulted in arrests. The prefecture of Moscow’s central region had initially declined permission for the protests. But when the prefecture was asked a second time by organisers, they agreed pursuant to one condition – that the protest be limited to only three activists. 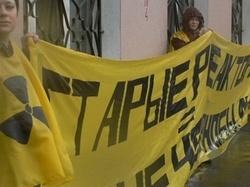 The demonstration, nonetheless, attracted the participation of 10 people from Moscow’s Ecodefence, Nizhny Novgorod’s Anti-nuclear Movement of Nizhny Novgorod, and Murmansk’s Nature and Youth environmental organisation. A detachment of police arrived on the scene within 10 minutes and detained three of the activists. At current, one of them has been released and two remain in custody at the Basmannoe District Police Station in central Moscow. “We are for the quickest shutdown of old nuclear reactors that have already exhausted their 30 year resources. There is not a single developed country on earth where such reactors would receive permission to operate at all,” said Ecodefence in statement. Ecologists confirm that permissions to extend the engineered life span of reactors at the Kola, Kursk, Novovoronezh, Leningrad and Biblin nuclear power plants have already gone through. By demand of the European Commission, Bulgaria, Lithuania, Ukraine, the Czech Republic and Slovakia, these old Soviet era reactors have been or are being taken out of service. However Russian authorities and the nuclear industry have not for the past 22 years realized all the dangers of the technology that led to the worst technical disaster in the history of the world. Vladimir Slivyak is co-chairman of the Ecodefence environmental group. Russia appoints new atomic oversight chief – will he stand up for Russia’s interests or bend with the Kremlin’s wind?